Looking for a low carb solution to driving, driving, driving around Glacier Country this summer? You can get there greener, especially when headed to the park. Give the bus a try —routes run from Kalispell or Whitefish to Glacier National Park for your convenience. Daily bus service is available July 1 – September 4 from Whitefish and Kalispell to Apgar Visitor Center. In Whitefish, the Glacier Park Express makes stops around town at convenient locations. After the Mountain Mall, your next stop is Apgar. The Kalispell Summer Bus route begins at Rosauers and makes stops in Columbia Falls (two locations), Hungry Horse and Coram before its final destination at Apgar Visitor Center. You can leave Whitefish or Kalispell early in the morning, and catch a return bus in the early evening, with several other daily routes available. 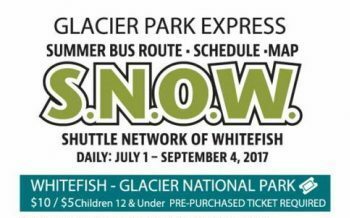 To travel from Whitefish, buy your eTicket at www.glacierparkexpress.org or buy paper tickets around town (round trip fares are $5 for children 12 and younger and $10 per adult). For Kalispell, just pay your fare ($3 one way or $5 round trip) to the driver. Kalispell buses are ADA accessible and equipped with lifts. Kalispell buses can carry two bikes, and Whitefish buses can carry up to three bikes. Whitefish or Kalispell — the rides are bargain priced for the frugal traveler. Compared to driving, you’ll save money. Parking spots in Glacier National Park are scarce during the summer. Live free and ride!Just pick up the shuttle at Apgar to get around the park. Get there greener. Bus travel beats the car for low carbon use, whether you go alone or with your family. Meet new people. Riders tend to be independent thinkers, practical, and adventure loving. Attention hikers, bikers, sight-seers, and carbon misers. You can ride the S.N.O.W. bus up and down the mountain to Whitefish Mountain Resort for free! Note to Kalispell travelers. Visit Flathead County Eagle Transit for the Kalispell Summer Bus schedule to Glacier National Park.